X-kit Achieve! 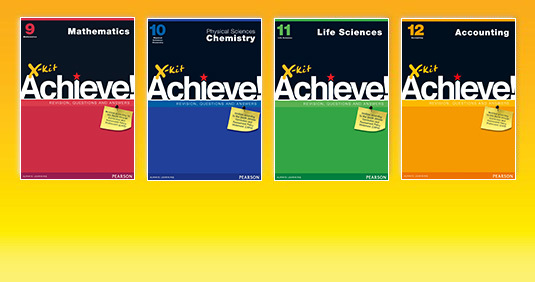 Grade 11 Mathematics Study Guide | X-Kit Achieve! Prepare for tests and exams on your mobile phone. 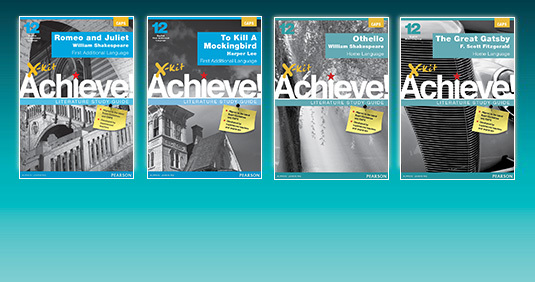 Save R85 on X-kit Achieve Study Packs. Your secret to exam success. Struggling with your prescribed literature? Our Literature Study Guides provide insights and analysis of themes and characters and includes guidelines for writing your exam. 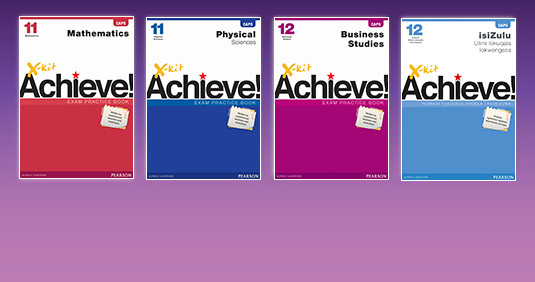 Our Exam Practice Books include full exam papers with complete memos. They follow the National Exam Guidelines. Approach your exams with confidence! Our CAPS-aligned Study Guides include step-by-step explanations, worked examples and plenty of exam practice. X-kit Achieve! Mathematics Grade 11 is a study guide which includes concise explanations, plenty of practice and sample test and exam papers with answers. The series has been developed based on research and feedback from learners and teachers. It offers Graded maths exercises which cover understanding, application and problem-solving skills. CAPS compliant. Exam practice is essential. Make sure your students have access to practice exam papers for the subjects they take. Make sure the exam papers relate to the correct version of the curriculum. Remind your students that studying should be active. They should be making notes, working through examples, doing practice exam papers and testing themselves on the sections they are studying. Different study methods work for different students. Encourage your learners to find out what works for them so you can support them. Many subjects require students to know work from the previous grades. Make sure your child has access to a good reference book that contains the concepts they need to refer back to. Be calm and supportive on the morning of the test or exam. Leave any difficult conversations for another time. Make sure your teenager has enough time to relax, do sport, play music and spend time with friends. A balanced lifestyle often leads to better results. Sit with your child and help him/her with their studies whenever you get time. Ask him to explain the work to you. Speak openly to your child so that he feels that he can share problems or concerns with you. The night before the exam, encourage your child to relax. Allow him to do something fun and make sure he gets to bed early. On the afternoon before the exam, get your child to review her notes and summaries, especially for sections of work where she is less confident. On the morning of the exam, get your child to go over his formulae sheets to remind him of key information. Once your teenager has completed practise exam papers, go over the areas where they struggle. Get a study guide to help you and your student if you need help with a particular section. Exam practice is essential. Make sure your student has access to practice exam papers for the subjects they take. Make sure the exam papers relate to the correct version of the curriculum. Studying should be active. Your child should be making notes, working through examples, doing practice exam papers and testing herself on the sections she is studying. Different study methods work for different students. Find out what works for your child so you understand how you can support him or her. When you are writing an exam, first write down all the formulae or important facts you are worried about forgetting. Make a list of the stationery and instruments you need for your exam and pack it the night before. Go to bed early the night before tests and exams so that you can wake up in time to quickly read through the sections you are worried about. Stay positive and confident! Believe that you can ace the test or the exam. Always test yourself on what you have studied - or ask someone else to test you. Make sure you know and can explain all formulas and theorems in your exams. These are easy marks. Once you have revised a section, do plenty of practice questions to check that you can apply your knowledge. Find out what study method works best for you. Use mindmaps, flow diagrams and/or notes. Work through worked examples and solutions step-by-step until you understand them well. Keep healthy: Exercise, drink water and eat food that is good for your body and mind. Look up definitions for words you don’t understand. Study for 30 to 45 minutes at a time and then take a break – otherwise you won’t concentrate as well. Create a realistic timetable to cover all the sections in all the subjects you are studying and try to stick to it. Give yourself plenty of time to study before tests and exams. Do extra questions and worksheets on sections you find difficult. Make sure you understand the work you are doing in class and don’t be afraid to ask for help if you need it. X-kit Achieve! Literature Study Guide: My Children! My Africa!